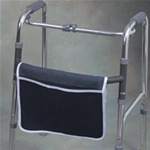 Allows walker to slide easily over most surfaces. Replaces standard walker tips. Provides a convenient storage area for quick access to personal items. Designed to fit most standard 1-inch walkers. Allows walker to slide easily over most surfaces. Replaces standard walker tips. Designed to fit most standard 1-inch walker. 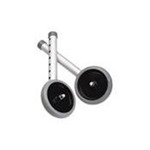 Fits most walker legs made of 1-1/8” diameter aluminum tubing.